OkAT partners with Oklahoma ABLE Tech and Fire Protection Publications, at Oklahoma State University to offer this free program to Oklahomans. Product Recall: due to manufacturer defect on Lifetone alert devices with the bed shaker. If your Lifetone does not have a digital display, Lifetone Technologies will replace at no cost to you. Lifetone will replace any model that falls within a specific serial number range. For complete details of the recall please go to: https://lifetonesafety.com/product-safety/ or call Lifetone Technologies at: 800-648-7923. To qualify, applicants must have a professional attest to their disability as part of their completed application. Note: Program available while supplies last. What equipment is used in your installation? Universal Smoke Alarm - dual sensor, sealed long-life battery smoke alarm (ETL listed). 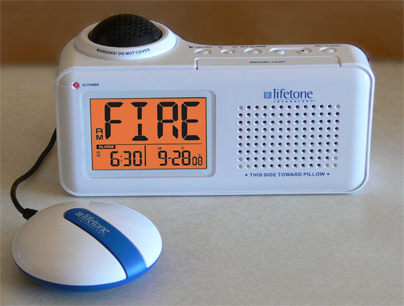 Lifetone - a bedside alert device that listens for the smoke alarms. The alert sits on the bedside of the sleeping person. It is plugged into an electrical outlet and has battery back-up for power outages. When it hears a smoke alarm, the alert system shows "FIRE," and emits a loud, low (baritone) T-3 sound, and says "FIRE! GET OUT!" in English and Spanish. It has a bed shaker that is placed under the mattress that shakes the bed to wake people up. 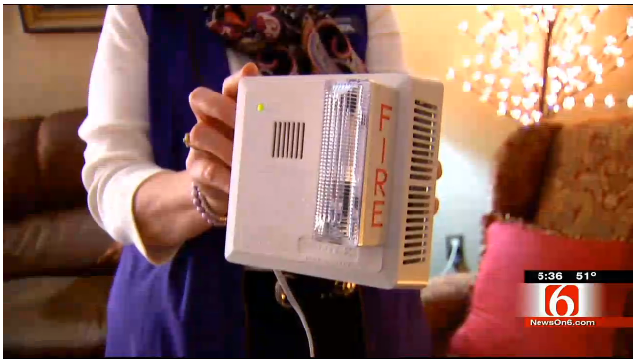 Gentex - a smoke alarm that has a 177 candela strobe in addition to its audio signal for people who are deaf. It is plugged into an electrical outlet. This smoke alarm is used as a visual alert when the consumer is up and about and not in bed.